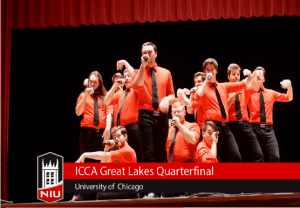 Watch the Huskie Hunks, along with the Harmelodics and NIU Northern Sound a cappella groups rehearse for and compete in the ICCA Great Lakes Quarterfinal. There’s a lot going on in the world of a cappella competitions right now, says NIU senior music business major Trent Synder. And, NIU’s award-winning a cappella group Huskie Hunks has their ears to the ground, ready to take advantage of the new landscape. 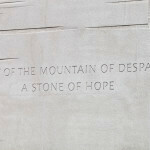 “It’s like the wild, wild west of a cappella. People are really just starting to figure it out and this year. We could really make a name for ourselves, grow the fan base. People around NIU people might start to take notice. Especially if we take home awards,” says Synder, president of the Huskie Hunks. People at NIU should take notice: The Huskie Hunks just earned a trip to the semi-finals of the prestigious Varsity Vocals International Championship of Collegiate A Cappella (ICCA) by taking second place at a recent quarter finals competition at the University of Chicago on Jan. 23. They competed against nine other a cappella groups during the quarter finals, including two other groups from NIU: The Harmelodics and NIU Northern Sound. The path to their ICCA success hit a few sour notes. They rehearsed for more than nine hours a week, but sometimes not as a full group, and used rolled-up paper for mics. Then came a less-than pitch perfect Send-Off Show at NIU’s Music Building. “It was a solid performance, but we all walked away feeling a little uneasy,” according to Huskie Hunk member Dustin King, a junior majoring in business. However, after a day of final rehearsals, including the opportunity to perform with live mics (instead of rolled-up paper) during an interview with a cappella radio station Acaville Radio, things were looking up. “I talked to all the guys afterwards and the response was, ‘I have no idea how we did,’ ” King says. They were pleasantly surprised when Huskie Hunks’ Casey Ancona won Outstanding Vocal Percussionist, and ecstatic with their second place overall finish–ensuring a spot in the ICCA Great Lakes Semifinals March 5 at the Auditorium Theater in Chicago. “I was just filled with so much joy and so much love for the guys who I performed with. I had so much appreciation for the hard work they all put into the set,” Synder says. The hard work continues as they rehearse for the semi-finals which will include several public performances. Learn about where you can see them perform and support their efforts to by visiting the Huskie Hunks Facebook page.